American singer-songwriter and musician Little Richard is widely regarded as one the early progenitors of rock ‘n’ roll and a highly influential figure in popular music and culture for more than half a century. His wailing vocals, thumping piano and high-energy onstage antics influenced countless artists across diverse genres, from soul to R&B and funk to rap. Richard has sold more than 35 million records worldwide. Born “Richard Wayne Penniman” in Macon, Georgia in 1932 into a big, religious household, his father a church deacon and night-club owner and mother was a member of Macon’s New Hope Baptist Church. He earned the nickname “Lil’ Richard” as a child due to his skinny and short stature. Richard started singing in church choir at an early age. Having a naturally loud and strong gospel voice, he also learned to play various instruments such as piano and saxophone. Richard cites Brother Joe May, Sister Rosetta Tharpe, Mahalia Jackson and Marion Williams as some of his major musical influences. Little Richard joined his first musical band, Buster Brown’s Orchestra, in 1949, replacing I.A. Harris as the singer. He signed a recording contract with RCA Victor in 1951, with the help of Zenas Sears, a local disc jockey. Richard’s first session in studio produced four recordings; namely “Every Hour”, “Goin’ to Get Rich Quick,” “Taxi Blues”, and “Why Did You Leave Me”. Richard’s major breakthrough came in 1951 when he switched Specialty Records. He recorded his 1955 classic “Tutti Frutti”, which reached number 2 on the Billboard Rhythm and Blues chart, and later entered the pop charts in both the US and UK. In the next few years, Richard released a series of chart-topping classics including “Long Tall Sally”, “Slippin’ and Slidin”, “Rip It Up”, “Reddy Teddy”, “She’s Got It”, “Heebie Jeebies”, “The Girl Can’t Help It”, “Lucille”, “Send Me Some Lovin'”, “Jenny, Jenny”, “Miss Ann”, “Keep A-Knockin'” and “Good Golly, Miss Molly”. He also starred in three of the earliest rock ‘n’ roll motion pictures; namely Don’t Knock the Rock (1956), The Girl Can’t Help It (1956), and Mister Rock and Roll (1957). Richard became a preacher and returned to religious music by the late 1950s. Although he attempted to return to rock music in 1963, he failed to sell many records. By the early 1970s, Richard made frequent appearances in rock ‘n’ roll revival shows and pursued non-musical interests. His critically acclaimed performance in the 1986 Paul Mazursky directed motion picture, Down & Out in Beverly Hills, was highly praised by film critics. 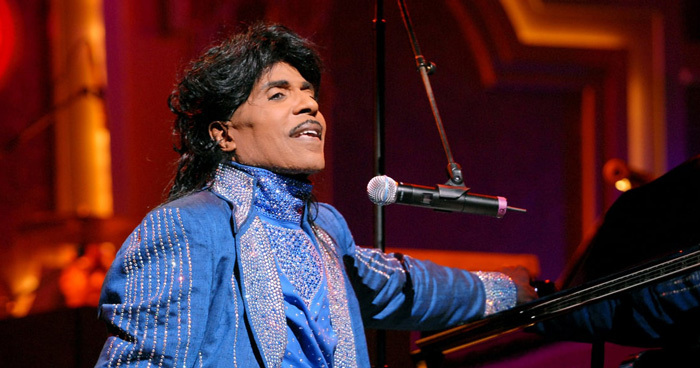 Little Richard has won numerous awards and accolades in his career, including three Grammy Hall of Fame Awards, the Grammy Lifetime Achievement Award, the BMI Icon Award, an American Music Award of Merit, the Rhythm and Blues Foundation Award, and a star on the Hollywood Walk of Fame. He has been inducted into seven music halls of fame: the Georgia Music Hall of Fame, the Rock and Roll Hall of Fame, the NAACP Image Award Hall of Fame, the Nashville Music City Walk of Fame, the Louisiana Music Hall of Fame, the Blues Hall of Fame, and the Rhythm and Blues Music Hall of Fame. Little Richard’s personal life has been the subject of extensive media attention. He gained press notoriety for his admitted drug use. His own family had cut off all relations with him and expelled him from the house over the issue of his sexual orientation. Richard married Ernestine Campbell, a secretary from Washington, D.C., in 1959. The couple adopted Danny Jones, the one-year-old son of a church associate in 1962.